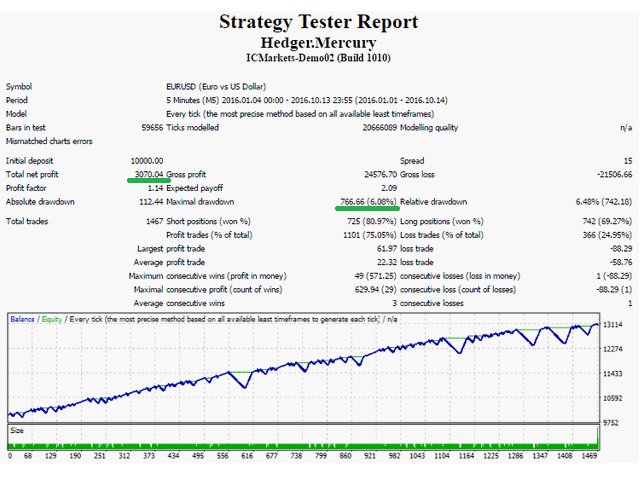 The Mercury Hedger EA is a trend scalper EA with elements of hedging. The standard parameters are optimized for trading the EURUSD M5 currency pair with the deposit of $10,000. The minimum deposit is $1000, provided the use of the starting lot of 0.01. The EA info window - "Current settings"
The title bar contains the name of the EA and its version, for example: "Hedger.Mercury v1.05". The EA info window - "Info"
The EA window - "Trade"
The trading panel is designed for opening orders manually (BUY and SELL buttons), as well as force-closing all positions (CLOSE ALL, CLOSE PROFIT, CLOSE LOSS buttons). The EA window - "Entry control"
3) Added automatic calculation LotFactor (only for Increase mode) when automatic calculation of initial lots mode enabled.